Unless we are about our Father's business, laying down our lives for others, our best intentions to deal with sin in our lives will crumble. 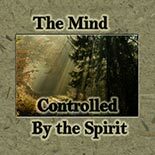 Is your mind controlled by the Spirit or are you trying to control your spirit with your mind? Our fruitfulness is related to our faithfulness, so let's break the cycles in our lives by faith in Jesus!